Okay, I’m going to mix this up a little by writing a review for Just One Day and Just One Year together. Both books are part of the Just One Day series by Gayle Forman. The reason I’m reviewing both books at the same time is because really, there’s no other way to read these books. I kind of feel sorry for the people who read Just One Day before reading Just One Year came out. Reading both one after another adds a lot to the reading experience. Both books cover the same time period but are in different PoV’s. I’m a sucker for fanfics and novellas which promise to tell me what’s going on inside the other character’s head. I like having different perspectives and figuring out what other characters are thinking. So, really it was pretty obvious I was going to like the books. They’re cute enough I guess. But they don’t have the same enthralling-slightly-haunting quality that ‘If I Stay’ and ‘Where She Went’ had. Those books had covers which pulled you in and kept you thinking about those books until you actually got to them. 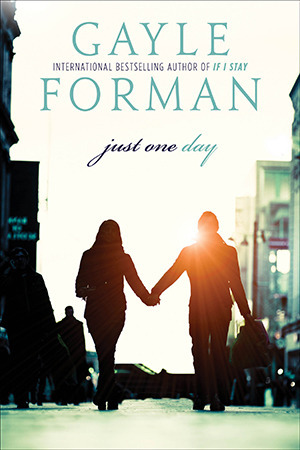 I think the problem with the cover for ‘Just One Day’ is that it’s so…adultish. So mature and picturesque. From the font of the text, to the silhouettes and the sunlight’s glare, everything is so effortlessly chic and mature. It’s intimidating. Really intimidating. A book about love, heartbreak, travel, identity, and the “accidents” of fate, Just One Day shows us how sometimes in order to get found, you first have to get lost. . And how often the people we are seeking are much closer than we know. Both books are bitter-sweet, emotional and ultimately so honest. Contrary to popular belief, this is not a romance book. Not really; It’s more of a book of self discovery and travel. In Paris, Allyson didn’t just lose Willem. She also found a stronger, more confident and more assertive part of her that Willem called Lulu. A lot of people think that her behaviour after losing a guy who she had been with for just 24 hours was ridiculous (her best friend included) but I felt like her loss was much more than that. The most hard-hitting part of her day in Paris was not the fact that she met a guy, got to know the important parts of him, spent a day in the most romantic city in the world with him and then ultimately lost lost him – all within a day. No, the most hard-hitting part of Lulu/Allyson’s day in Paris was she realized that the rest of her life had been meaningless and that she been striving hard to complete her parent’s goals and match their expectations rather than her own. This book is what I wanted ‘The Infinite Moment of Us’ to be like. I loved the first part of the book. That part was a fun and cute read. In fact, just reading the book was enough to make me want to go to Paris. I was kind of bored around the middle. Her depression and confusion throughout the first semester was not exactly fun to read about. But it served it’s purpose. I fell in love with the book again as soon as Allyson decided to go back to Paris. Her job, her French Classes and her interaction with her friends at University was amazing to read about. Can you fall in love three times in one sitting? I did. I fell in love with this book again during her second Europe trip as she flitted from one place to another, a stronger and more impulsive creature this time around. Willem also goes on a journey of self discovery. Literally. He travels around the world going to destinations as exotic as the Netherlands, France, Mexico and India. I loved getting into his head. Oh My God! I felt for this guy. I really did. The backstory I wondered about in ‘Just One Day’ was shown in this book and let me just say- I completely understand. All those little niggling doubts that I had about him in book 1, they disappeared by the middle of book 2. There were parts I found really frustrating. The parts where Willem and Allyson came so close to finding each other but missed each other by a hair almost made me want to tear out my own. I was so invested in the story, I ranted and cried for almost ten minutes before picking up the book again. I loved meeting his friends and seeing his charisma in action as he met new people. His reconciliation with his mother was a complicated one but ultimately it was a beautiful one. Okay, I’ve covered most of this in the plot section but there’s a little bit more I want to add. Can I just say that Allyson was a character I really identified with? I’m the quintessential book geek. You know the type. Painfully shy, overly obedient, desperate for an adventure but not bold enough to actually grab a real opportunity. I guess I live vicariously through books. And Allyson was much the same at the beginning of the book. But unlike me, Allyson didn’t have to live vicariously through a book. She actually went to Paris and grabbed her own adventure. I guess books like these are meant to give us book geeks hope that we might actually have an adventure someday. But unlike most books, this book actually managed to convince me that I’ll get the chance and I’ll take it. Allyson becomes stronger, more impulsive and enthusiastic as the book progresses. I don’t know if I’ll ever be able to attack a gang member with a book but I definitely cheered Allyson on as she did. Similarly, I don’t think I could do something as impulsive as marching up and down the canals of Paris and bribing a boat operator to take me for a ride. But Allyson did and I loved her for it. Willem was a character who was so much more complex than was shown in book 1. Seeing everything from his perspective was surprisingly…enlightening. In book one, I wasn’t really a fan of his. He was overly light-hearted and flippant. I couldn’t really understand his motives at any point of book 1. But seeing everything from his point of view. Wow! I think I kind of misjudged him. That light-hearted and flippant guy? Yeah- that was all just a farce. Seeing his issues- the way his family had fallen apart after his father’s death, the abandonment he felt from his mother never being around on account of her being too busy to help the misfortunates of the world instead of him and the real loss and desperation he felt after losing Lulu (Allyson) because he felt like she was the only one who saw right through his farce. It made me feel for him. I might have empathized with Allyson but all my sympathy went to Will. Besides these awesome MC’s, there was a great set of supporting characters. For example: Allyson’s mom. At first, I thought she was the villain of the piece. She was a helicopter parent, pushing Allyson to become a doctor even though she didn’t really want to be one and was completely unsupportive of Allyson’s trip back to Paris. But by the end, I was able to understand that she never meant to hurt Allsyon, that Allyson had hurt her quite a bit and why she wanted Allyon to become a doctor. Brodi was a guy who was goofy enough to provide comic relief (his name literally means sandwich) but thoroughly sincere and caring enough to be more than 2-dimensional. It was insta-love on both parts. Actually, maybe it was more like lust within a second, love within a day. But just for the record, this was the most beautiful insta-love I’ve ever read. Within a single day in Paris, the two were actually able to get to know the important things about each other. Well, everything but names and addresses. But let’s face it, if they had thought to take those from each other, there wouldn’t have been a story for us to read. The ending was seriously beautiful. Just as both of them had given up hope for finding each other, they found each other. You know that quote: When you stop looking for something, you find it. My only gripe is that there are so many questions left unanswered. Or actually there’s only two important ones. Now that they’ve found each other, what will they do? And, Will they be able to live up to each other’s expectations? I’m definitely going to read ‘Just One Night’ as soon as it comes out on May 29th. It’s a short story and the conclusion to this amazing series. Both ‘Just One Day’ and ‘Just One Year’ end with Allyson walking into Willem’s flat and I’m just dying to know what comes next. And that’s what ‘Just One Night’ promises to tell us. I just hope the book can live up to all my expectations because this time, they’re seriously high. This series is one that you just can not miss. It’s not just young-adult, I’m pretty sure some adult readers will enjoy this too. The nice thing about this series is that it can fit into so many genres so well and it can still be the best in every single one of them. Chick-lit,Contemporary, Romance, Young-Adult, New-Adult, Self-Discovery and Miraculous. This entry was posted in About Me, Book Reviews. Bookmark the permalink.